Porsche earned its status with the 911, a car that even today remains a world standard for what a sports car should be. By the 1970s the 911 had become a revered exotic sports car; however its price tag was out of reach for most people. Porsche to its credit had anticipated this problem and released the 914 and later the 924, both of which were sports cars marketed to the middle class. Unfortunately both fell short of this task. They were not bad cars but they gave the target customer the impression of buying a Porsche in name only (in other words, not a true performance car). The 914 and 924 had decent sales, but the critics gave both a bad rap for falling short of what they expected of a Porsche. Fortunately Porsche understood this dilemma and decided to offer a true sports car for a reasonable price that the masses would want – the 944. Porsche released the 944 (a brand new model) in 1982. The U.S. version of the 944 would not be released until the 1983 model year. The 944 was essentially a redesigned 924. 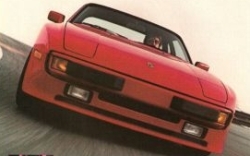 The 924, which Porsche released in 1976, had an underpowered 2.0 liter Audi-sourced in-line four-cylinder engine. Porsche tried to get around this problem by offering a turbo option, but the 924 still fell short. The exterior was a sleek aerodynamic design, but overall the car had a stripped, bare-bones look. The cheap-looking, emaciated steel wheels on some of the early 924 models certainly did not help. 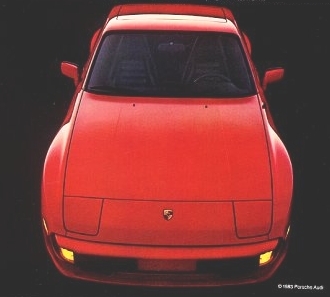 The rear-wheel drive/front engine 924 was also a change in direction for Porsche, since the 911 was a rear-wheel drive/rear engine configuration. To make the 944, Porsche reworked the 924 body, giving it more muscular quarter panels (using a look similar to the 924 Carrera GTS). The finished product was so well-done it was hard to believe that anything based on the 924 could look so good. This change also allowed wider wheels and tires to be used on the 944. The end result was a work of art. The front air dam, which housed dual fog lights, was body colored and flowed nicely with the rest of the 944’s lines. There were attractive black bumperettes on the front and back of the car (which were not on the European-spec 944) that gave the car a serious look and cosmetically matched the black rear spoiler and the beautiful 15×7” black alloy wheels. The pop-up headlights were the same units found on the 924 but looked great with the new bodywork. The dual side 911 style mirrors were also a very sporty touch. The biggest change was in the power plant, which was a new single overhead cam, 2.5 liter four. The design was taken directly from the Porsche 928’s SOHC V8 (it was one half of the SOHC V8). Inherently, an inline four-cylinder motor tends to not be a smooth power plant; vibration and noise are the norm. This was one of the problems with the 924’s Audi-sourced 2.0 four motor. Porsche did its homework and implemented counter-rotating balance shafts making the SOHC 2.5 four very smooth during operation. The 2.5 liter engine had a 3.94 in. bore and 3.11 in. stroke, along with a 9.7:1 compression ratio. The SOHC 2.5 liter engine, which had only 2 valves per cylinder, still made an impressive 147 horsepower and 140 lbs.-ft. of torque. This was no small feat. Most V6 motors back in 1983 produced less than 147 horsepower and most four cylinder motors had an output of less than 100 horsepower. As a comparison, GM’s 2.5 liter Iron Duke four made 92 horsepower. One of the reasons why the Porsche motor made so much horsepower was the sophisticated Bosch LE Jetronic multiport fuel injection system. The block and heads were aluminum on the Porsche 2.5 liter engine, which helped to keep the motor weight down. And keeping the weight down helped to make the 944 a quick car. A 1983 Porsche 944 (with the standard five- speed manual transmission) went 0-60 mph in just under 9 seconds and the quarter mile slightly above 16 seconds. These times today would be considered slow, but back in 1983 these figures were very impressive. The top speed of the 944 was just below 140 mph. Slightly slower acceleration times and a lower top speed were to be expected with the 944’s optional three-speed automatic transmission. Understandably most buyers did not opt for the three-speed automatic, and went with the standard five-speed manual. Where the 944 really shined was in handling and braking. Porsche made sure that the 944 was very well rounded and it performed like a sports car in all performance categories. The 944 suspension was a quantum leap from the 924. The front suspension employed MacPherson struts, coil springs and an anti-roll bar. The rear was a semi-trailing arm design with torsion bars and an anti-roll bar. The weight distribution of the 944 was a near 50/50 (front/back) which certainly helped in the handling area. The 944 had four-wheel vacuum assisted vented disc brakes, so stops were quick and very controllable. Though the 944 was reasonable priced for a Porsche, the interior (when ordered with optional leather seats) was as fancy as the more upscale 911 and 928. The interior was comfortable and the front seats offered good lumbar support. The shifter was in the right place, only a few inches away from the steering wheel. The gauges were easy to read and placed where they belonged. And for a sports car the back seat – which fit two passengers rather tightly – was not bad for short hauls and far better than expected in a car of this type. As could be expected demand was high for the 1983 Porsche 944 in the U.S. There were more buyers than cars the first year. Porsche had priced the car right, too. Its base price was $18,980, substantially lower than the 1984 Corvette (released in March of 1983) which had a base price of $21,800. The really good news is a used 944 is still very affordable. The current high retail value of a mint condition 1983 944 is $7,850 (according to NADA). That’s a lot of fond memories and performance for the money. Replacement parts are not too hard to come by either. There are also plenty of aftermarket parts to make a 944 go faster, handle better and stop better. However if you plan on dropping the car off for servicing at a Porsche mechanic expect to pay the same higher prices as other Porsche owners. 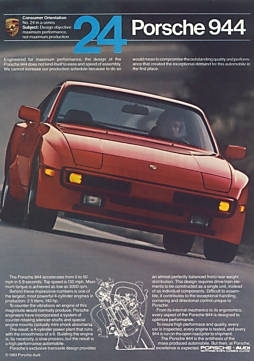 Anyone who read auto magazines back in 1983 will remember the beautiful 944 ads which were part of the (numbered) Porsche “Consumer Orientation” advertisement series. Each ad was a Porsche lesson many auto enthusiasts will never forget. This writer as a teenager used to remove all the new Porsche “Consumer Orientation” ads out of his auto magazines and stick them to his bedroom wall. It was a time when Porsche was the world standard in sports cars and yet its cars were still obtainable for the average person. A lot has changed over the years. Porsche had a successful run with the 944. 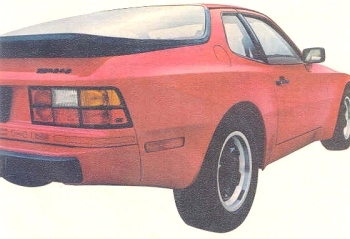 A turbo model was available a few years after the 944’s original release, then in the 1990s the 968 name replaced the 944 (and a few years thereafter the 968 would be cancelled). By the 1990s Porsche had ratcheted up the price tags on all its cars so much that its entire lineup was out of reach of the regular Joe. The 1983 Porsche 944 was certainly a bright hope in auto history. This was a true exotic sports car that an average person could own and be the envy of many. Unfortunately this is unlikely to ever be repeated by Porsche again, which explains why teenagers today don’t tack Porsche ads onto their bedroom walls anymore.